Bee pollen is a delicious treat from Mother Nature. Contains a variety of nutrients including vitamins, minerals, protein, carbohydrates and fatty acids. 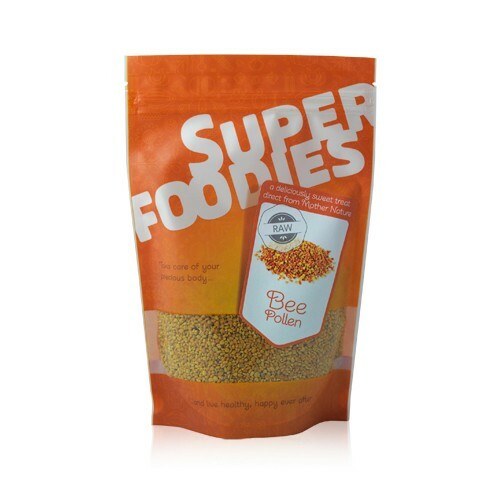 Bee pollen is made from the pollen grain that is collected by honeybees and returned to their hive. Often referred to as "Ambrosia", which means "Food of God" in Greek mythology, bee pollen contains an impressive selection of valuable nutrients, including protein, vitamins (A, B complex, C, D & E), minerals (selenium, magnesium, calcium, copper, iron, silica, phosphorous, sulphur, chlorine and manganese), amino acids, enzymes, coenzymes, lecithin, carbohydrates (in the form of natural sugars), fatty acids, hormones and trace elements. Bee pollen contains vitamins A, B complex, C, D & E.
Contains the minerals, selenium, magnesium, calcium, copper, iron, silica, phosphorous, sulphur, chlorine and manganese. Contains 20 out of the 22 essential amino acids. Has protein, enzymes, coenzymes, lecithin, carbohydrates (in the form of natural sugars), fatty acids, hormones and trace elements. Dried at the same temperature as the beehive (under 38 degrees) and contains less than 7% moisture to guarantee only the finest quality and flavour. Is totally pure and contains zero additives. Is suitable for those following a vegetarian or rawfood diet. Bee pollen can be enjoyed pure (try melting a teaspoon of bee pollen directly in your mouth), stirred into your choice of smoothies, shakes and protein drinks or sprinkled liberally over breakfast dishes and trail mixes. Now simply put all the other ingredients into your blender and blend everything together until a smooth vibrant coloured smoothie. Smells amazing and tastes delicious! 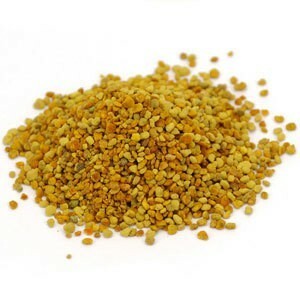 Bee Pollen is sometimes referred to as "Ambrosia" or “Food of God’’ in Greek mythology. Bee products have long been incredibly popular - indeed they were even attributed healing powers in the ancient Hindu writings of "Rig-Veda" from 2000-3000 BC. Bee pollen is made from millions of microscopic pollen grains that are collected by bees, bound together with nectar (creating small balls of bee pollen) and transported to the hive before being collected by beekeepers. Many experts consider Spanish bee pollen to be the finest in the world. Do not buy Spanish bee pollen if you have an allergy to pollen. Bee pollen may cause severe allergic reactions including shortness of breath, hives, swelling, and anaphylaxis. Always read the information on the packaging before choosing to eat bee pollen. Consult your GP before you order Spanish bee pollen. Do not buy Spanish bee pollen if you are pregnant or breastfeeding. Absolutely fabulous product goes great in my morning smoothie and my evening shakes!! Tasty and creamy!! Also good for sore throats (my dad says so!!) melt a little in some warm water and sip - very soothing!